Today, the debate about political art is everywhere. The recent issue of Open magazine on populism takes a refreshing stance in the discussion by defining politics as the art of the imagination. In the introductory essay, guest editor Merijn Oudenampsen sketches a picture of a political struggle that revolves around the articulating and re-articulating of stories. The winning narrative is the one that best corresponds with the intimate desires of the masses and gives direction to these desires. In this way, political history is shown as an accumulation of stories that come and go on the fickle cadence of the beliefs of the people. The narrative can go off to the left or to the right, include or exclude different groups, but what matters is the power of the imagination. It need surprise no one that in this analysis, the master of Dutch political art turns out to be Geert Wilders. His popular narratives – about the centuries-old battle against the sea, against the clique in The Hague, against the elites of the Amsterdam canals, against Brussels and against Islamization – do not need to fear much opposition. Oudenampsen accuses left-wing politics of refusing to see that the political struggle is about the power of the imagination to mobilize and impose discipline. Given the failure of the political left in the Netherlands, Oudenampsen draws a line around a playing field for political art. New narratives must engage in battle with Wilders’ monopoly on shaping the popular imagination. The fact that this battle will not be easy is also demonstrated by Oudenampsen’s most important example: Martin Luther King. From King’s noble dream – in which black Americans also had fundamental rights to education, housing and employment – this leader of the American civil rights movement was ingeniously capable of re-writing the American dream and making it universally applicable. Reducing Martin Luther King to his dream in fact raises doubts about Oudenampsen’s search for new left-wing stories. He imposes limits on the new political art he hopes to inspire. Martin Luther King, in contrast, centred his march on Washington squarely in reality. At the beginning of his speech, King clearly indicated that he was speaking in the shadow of Abraham Lincoln, who had proclaimed the emancipation of slaves a full century before. A glance at the shameful living conditions of black communities in 1963 revealed that not a great deal had happened over that period where those fundamental rights were concerned. King described the march on Washington as immediately cashing a check that had been circulating for 100 years, but that kept being returned with the message, ‘insufficient funds’. Martin Luther King did not invent a new narrative, but rather refused to accept or believe that the narratives of the state were bankrupt. His primary focus was to connect the deep desire for freedom amongst black Americans to the constitutional ideal of liberty. With his enthusiastic embrace of the American dream, King not only had to do battle with white racist groups, but also with his own rank-and-file. The black population risked letting all thoughts of actively pursing freedom slip away in a cynical retreat into their own black state or into messianic expectations for the future. Now, more than ever, it is this connection of prevailing narratives to reality that is needed, here in the Netherlands as well. There is certainly enough material available. We are not even talking so much about the Netherlands’ ‘purple’ coalition dream of a multicultural society, which has already often been declared a failure by both Wilders and the traditional parties themselves. What is more important is that Wilders’ own politics are ultimately also made up of a dream of freedom and responsibility. This offers the unique possibilities for the left – in the spirit of Martin Luther King – to make liberal daydreams universal and force their realization. Oudenampsen is justified in his claim that today, the left is failing because of its lack of imagination. The problem is actually that the left is not realistic enough to cash in on Geert Wilders’ bounced checks. If there are opportunities lying around for political engagement in art, this is certainly where they can be found. This political art in fact has no chance of success if it does not first put its own house in order. Step one is putting to rest the critical reflex amongst political artists against everything that even bears a whiff of populism. This hypersensitivity generates nothing except the increasing marginalization of art. Step two is to abandon the belief that progressive narratives are consistently recuperated by the populist right – something that is very present in the essay by Oudenampsen. Martin Luther King proved precisely the opposite, that deeply conservative narratives contain elements that can be put to progressive advantage. 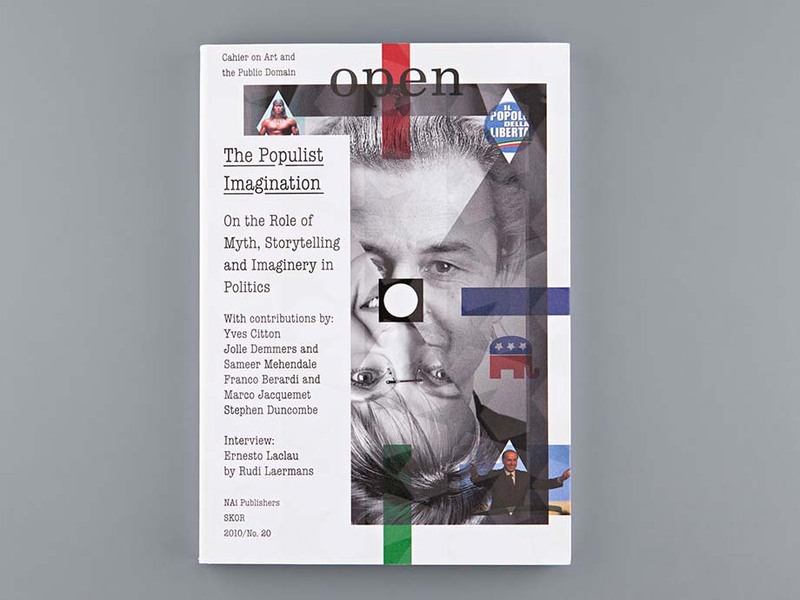 Read the essay ‘Political populism: speaking to the imagination of Merijn Oudenampsen in Open 20: ‘The populist imagination: On the Role of Myth, Storytelling and Imaginary in Politics’.